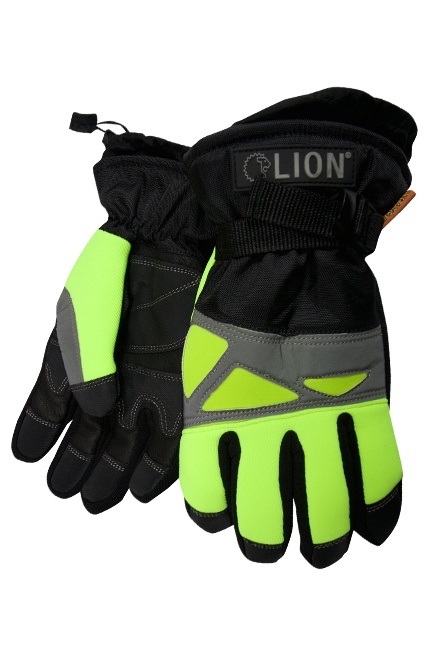 Lion's Cold Weather Gloves are perfect to keep your hands warm in freezing conditions, while also protecting them. Hand Protection: Provides hand protection and warmth during cold temperatures. Visibility: Hi-Vis lime-yellow on back of hand and reflective accents provide high visibility. Wrist Coverage: Gauntlet style wrist with take-up strap and additional cuff toggle closure. Extended Wear: Designed with wear patches on palm and finger tips for extended wear. Warm: Designed with a thermal liner to keep warmth in. Waterproof: Includes waterproof membrane to keep hands dry. Durable: Synthetic leather palm and wear patches help extend wear life. Wide Range of Sizes: Available in sizes XS-2XL and Cadet.